uuid : 32bee34a-1ac4-4522-9e36-d76de608ef95 templates_id: 119581 templates_uuid: "083dd7f2-0887-4fd5-a022-06e433f99850" title: "Grievance letter to your employer - Grievance template" display_name: "Grievance letter" meta_keywords: "Employee grievance letter" description: "
Write a grievance letter with this template when you want to make a formal complaint to your employer. This grievance letter covers a number of situations which may lead to a complaint including discrimination, bullying, health and safety concerns and breach of contract. Set out your grievance and when it started, how you tried to address the issue and your proposals for resolving the grievance. You can also choose to be accompanied by someone at the grievance hearing. An employee can use a grievance letter to make a formal complaint to an employer. It sets out what your grievance is and when it started, how the employee has tried to resolve it informally and any proposals for resolving the issue. Why do I need a grievance letter? You need a grievance letter when you want to raise a formal complaint about an issue at work such as discrimination, bullying, health and safety concerns or breach of contract eg. if you haven\302\222t been paid on time. What steps should I take before submitting grievance letter? Employees should aim to settle most grievances informally with their line manager. This should be done by speaking directly to a manager or an employer. If the issue is still unresolved, you can then submit a grievance letter to your employer. It should be done without unreasonable delay, so the issue can be dealt with as swiftly as possible. Is grievance letter a legal action against employer? 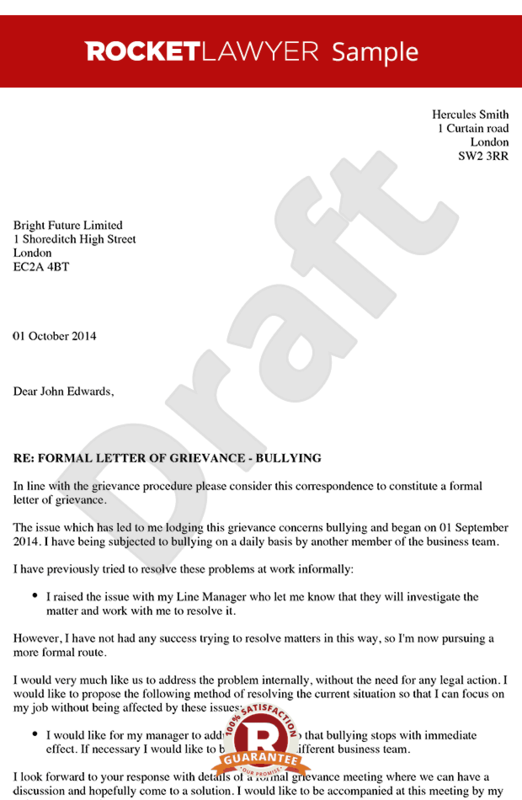 A grievance letter is not a legal action against employer. It is simply a letter of complaint to an employer about your problems or concerns at work. What happens after I have submitted a grievance letter? Your employer should arrange to have a meeting to discuss the grievance. You can choose to be accompanied if you wish. The aim of this meeting is to resolve the issue. If no further agreement is found you may need to take your employer to Employment Tribunal if appropriate.
" created_timestamp: "2018-10-08 04:37:07.0" modified_timestamp: "2018-10-08 04:37:07.0" active: true created_by: 157 modified_by: 157 dcm_id: 332 url_slug: "Grievance-letter-to-an-employer" meta_description: "Write a grievance letter to send to your employer about work issues. Set out your grievance with in this grievance letter template. Find out how to write a grievance properly." time_to_complete: "10 minutes"
You need a grievance letter when you want to raise a formal complaint about an issue at work such as discrimination, bullying, health and safety concerns or breach of contract eg. if you havent been paid on time. More than just a Grievance letter template, our step-by-step interview and guidance makes it easy to create your document. Easily create online, download, print and sign your free Grievance letter in minutes. This document is also sometimes called: Employee grievance letter.